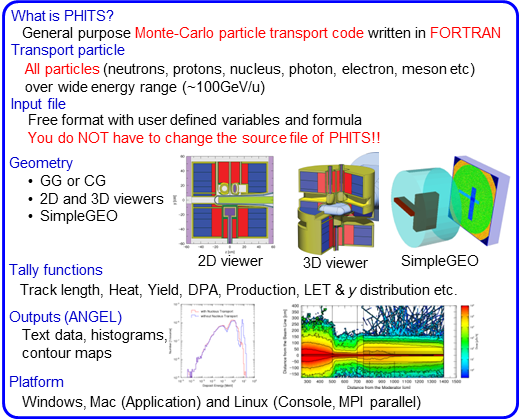 PHITS is a general purpose Monte Carlo particle transport code written in FORTRAN. PHITS can deal with the transport of all particles (nucleons, nuclei, mesons, photons, and electrons) over wide energy ranges, using several nuclear reaction models and nuclear data libraries. Geometrical configuration of the simulation can be set with GG (General Geometry) or CG (Combinatorial Geometry). Various quantities such as heat deposition, track length and production yields can be deduced from the simulation, using implemented estimator functions called "tally". The code also has a function to draw 2D and 3D figures of the calculated results as well as the setup geometries, using a code ANGEL. PHITS can be executed on almost all computers (Windows, Mac and Linux).